I wish I could take a picture that did justice to the fuschia plant hanging on my back porch as I look out the back door. The red buds hanging down are reflected in the shiny black granite countertop in my kitchen. 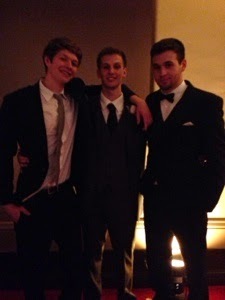 But, instead, I'll post a picture from a graduation party last night. Some parents in our little town are wealthy, and they don't spare expense at a graduation party. Last night's party had a food truck that served tacos and an open bar. I drank two gin and tonics! 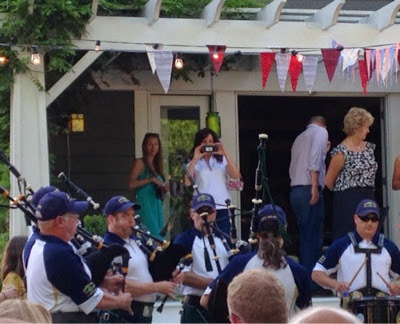 But the real surprise came when the bagpipers marched in. 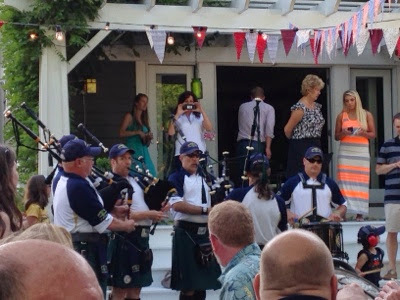 I always think of bagpipers as Scottish, but these guys wore solid green kilts so I guess they were Irish to fit one of the graduates, Dempsey. Some parents spare no expense. During the day yesterday, I had another surprise. Someone had left the window down in the car. 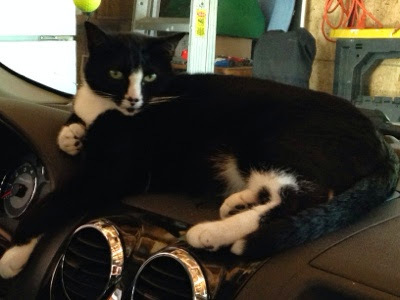 Our outdoor cat decided the dashboard was a perfect place to lounge. He's giving me a look that says, "What?" A month of not running culminate today in making me feel restless and unhappy. I feel like I've overdosed on caffeine. Antsy. Unable to settle. Everyone is making me irritated. I pace back and forth in the library parking lot talking on the phone to my best friend in faraway Michigan. She listens to my litany of complaints. He did this... then he did that. I know, deep down, that the problem is I haven't been able to run since Easter -- April 22. I set my goal to run 40 days during Lent. And I did it. I ran over 100 miles in the first three weeks of April alone, ignoring the pain that started to build in my heel. On Easter, I went for a short run. I decided to take a week off to let my foot heal. The following Saturday, I ran five miles and felt fine, but the day after, the pain was worse than before. I rested again, trying to run some mornings, but not making it farther than the corner before I turned around and limped home. My running shoes are up on blocks now. I go online to diagnose my injury. Could be my achilles tendon. I stretch in bed before getting up. I stretch against the wall. I stretch on the stairs. The pain does not improve. And it doesn't quite match the description of that first step in the morning being the most painful. Sometimes I wake up at night with my foot in pain because I'm lying on that side and pushing against the side of my foot. No, I haven't been to the doctor yet. I watch our medical spending account fly away for ridiculous costs that I hadn't expected, and I try not to spend any more on something that I feel sure will heal with just a little more rest. I feel my body changing. When I rest my hands on my hips they feel loose and jiggly rather than tight muscle. And now this, this nervous energy with no place to let it out. I walk three miles this morning with my friend Sheila. That's the farthest I've walked in a while, but by mid-afternoon, my house full of adult children home for the summer, my husband home on vacation this week -- I feel an itching inside me that no fingernails could ever reach. I have to run in the morning. It doesn't matter how much my foot may hurt. That anxiety inside is worse. 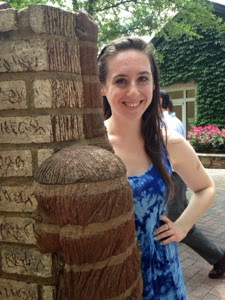 Finally recovering from the graduation festivities this weekend and on Tuesday I dived right into summer classes. 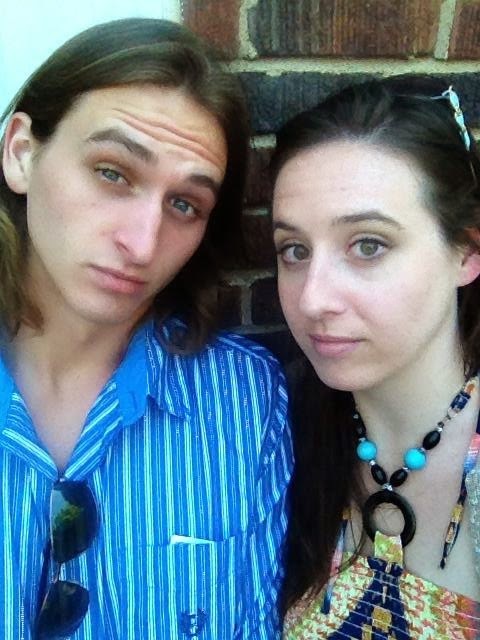 So I'll just share with you this selfie taken by my two oldest children at graduation. Spencer, home from college in Florida, and Grace, home from college north of Columbus, patiently sat through the speeches and pictures on Sunday. They let it all be about Tucker. I was renewing library books when I realized one of the books is due on Thursday and I haven't started reading it. 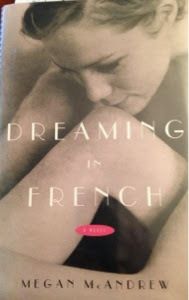 I quickly pulled it from the shelf and started yesterday -- Dreaming in French by Megan McAndrew. I thought I liked the cover, but the more I look at it... I thought she had her face against her knee, but it can't be her knee because it is too skinny. I'm not sure. Amazon has a different cover for it now. Astrid became a Marxist after it stopped being fashionable, even in France, but fashion, as she always told us, was for people without imagination. How a woman who shopped at Sonia Rykiel could have discovered within herself a sudden solidarity with the working classes was a matter for some perplexity, though not on the part of Lea, who expressed the view that our mother was unstable. At sixteen my older sister was cultivating cynicism. She had also just gone on the pill, which was easy to do in those days. All it took was a visit to the clinique on Rue Bonaparte, where the darkly handsome Docteur Bernard, who looked more like a hairdresser than a gynecologist, dispensed contraception to the young sirens of the Sixth Arrondissement after the most nominal of examinations and, it was rumored, occasionally seduced one, though Lea was disappointingly not among their number. Why Lea had sought birth control was in itself cause for speculation, since she didn't have a boyfriend. But, as she grimly told me, it was better to be prepared. Grimness was a sentiment that gripped Lea frequently. 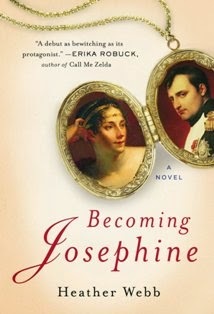 Like Vera in War and Peace, my older sister saw herself as the only dignified member of a ridiculous family. She bore our mother's idiosyncrasies stoically but, in her heart, my sister thought of herself as French, and French mothers did not go to ashrams in India, or march in demonstrations, or hire Maoist housepainters, or walk around the apartment wearing nothing but red nail polish. I'm joining in with Teaser Tuesday this week too, but the intro is so long that I'll let it stand for both First Paragraph and Tuesday Teaser. Looking forward to seeing all of your books. I'm exhausted after all the graduation hoopla this weekend, but I'm still dreaming of France while watching a House Hunters International with a couple looking for an apartment in Grenoble, France. Does this bother anyone else who loves France? I'm watching a couple who allegedly are entranced by France, and they are always surprised by the bathrooms. Yes, the bath and the sink are in one room. The toilet is in a separate room in many French apartments and houses. 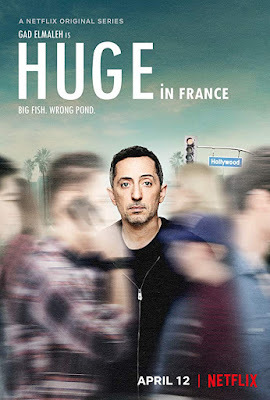 Maybe they have never visited France before, or maybe they only stayed in American-style hotels so didn't realize the French frequently separate the toilet from the rest of the bathroom, but surely they've seen it when they watched other people on House Hunters International. When Earl and I went to France the last time, we ate at a well-known steakhouse le Relais de l'Entrecote (a chain as our French friend pointed out). For some reason, I took a picture, a selfie, in the bathroom mirror. So since I'm obsessing about people complaining about bathrooms in France, I thought I'd feature that. I took out my phone to take a picture of the strange way the toilet flushes, because in France, almost every toilet has a different was to flush -- chains or buttons or a handle built into the side. I didn't get pictures of enough different kinds of toilets to write a blog post about it though. Did you have to adjust to weird toilets in France? Would you complain if you got to find an apartment in France? Hope everyone in the U.S. is having a wonderful holiday weekend, our Memorial Day. As you all predicted, the party went off just fine. I even managed to relax a bit. One of the best things about throwing a backyard party is that I get to use all my French tablecloths. The weather was perfect -- sunny and a high of 72 degrees. Here's Tucker standing next to me with some of the crowd in the background. Probably 75-100 people filtered through, congratulating Tucker and Josh. The sangria went like gangbusters with just enough left so that I didn't worry people went without. We had so much food! 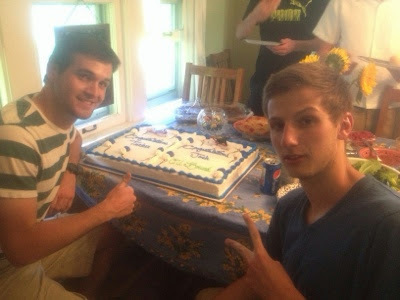 Tucker had his graduation party with his best friend Josh. Luckily, Josh's dad is a chef, so he took care of most of the food. We had pulled pork and barbecued chicken sandwiches, along with potato salad, pasta salad and pizza pinwheels. I made a green salad, tortilla chips and desserts, along with buying a sheet cake. I made a turtle cake, and there were only two pieces left at the end of the night. Plenty of the boys' high school friends showed up, which always makes it more fun for them. And the boys headed off to more graduation parties afterward. We stayed outside under the canopies long after night had fallen and the first mosquitoes of summer had begun to bite before we moved indoors. Now, with the graduation party behind us, we can relax and enjoy the actual ceremony on Sunday. Plus, I get to visit with my parents this weekend since they came in from Florida. 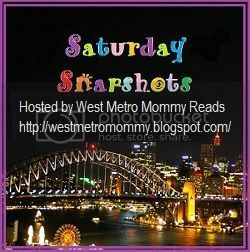 I'm playing along with Saturday Snapshot. The graduation party is today, so, of course, I woke up at 4:07 a.m. with a litany of all the things I need to accomplish. I lay in bed until 5 before I got up, only to find Tucker asleep on the couch in the living room. I don't know why, and won't know until he wakes up later, so I'm creeping around the house in the dark to let him get a little more sleep. I wonder if sleeping on the couch has anything to do with the fact that he got hit by a car two days ago as he was riding his bike. He's okay, just skinned up and shaken up. He called me right after it happened. It makes me feel thankful that his first reaction is still to call mom. He wouldn't let me come get him, said he was walking the bike home, but we both were shaking when he came through the back door, his palms, elbows and knees bleeding. The car just pulled out in front of him and hit his front tire throwing him off the bike. The car didn't even stop. Other than asking me to put Bandaids smeared with antibiotic ointment onto his palms and explaining why he can't help with yardwork because of his wounds, he has acted like everything is fine. I vented a bit on Facebook about the car that didn't stop, and an old high school classmate sent me a message, saying she knows how difficult this time of year is for our family. Yes, that adds to the tension. A graduation on Memorial Day, just like my sister's graduation on the weekend she was killed. We're so lucky that Tucker walked through the back door, and I guess that puts my worries about a party in better perspective. This weekend, we'll celebrate and not worry about whether the house is clean enough or the lawn is perfect or the food will last through the crowd. This is one of those weeks with the potential for high stress. My youngest graduates from high school on Sunday and we are holding his graduation party on Friday evening. It's a joint party with another friend, but it's at our house, which is why I spent two hours cleaning the refrigerator yesterday. I'm bad at hosting parties. I have a new friend who claims she is going to show up and make me take shots to make me enjoy the party. Where is she the week leading up to the party? It was almost midnight and Dexter Yates was in bed with his girlfriend when his phone burst into life. Possessed of lightning reflexes, she grabbed it off the bedside table before he could reach it himself. Honestly, some people were so mistrustful. "So the first place was too noisy," Alice announced as they drove into Briarwood. "And the second was too...?" "Wrong in every conceivable way." Dex slowed down as they passed the ivy-clad pub on the left. That was something else he'd have to check out; no point moving into a village with a rubbish pub. I know that Mansell's books will sail me away to Great Britain and the characters will get all in a muddle. It's perfect reading for my potentially stressful week. What if you left your life for six months then popped back in. What do you think would be different? That's kind of what happened for my oldest son Spencer. I took him back to college on Jan. 3. He arrived home last night. "Where's the trash can?" he asked turning toward the kitchen corner where the trash can used to be. We painted that corner of the kitchen and moved the trashcan under the sink. "Can I take a shower in the downstairs bathroom?" he asked. "Ask Dad," I told him. "He just caulked it." "Where is Dad?" he asked. "Still in bed?" The clock read 11:19 a.m. 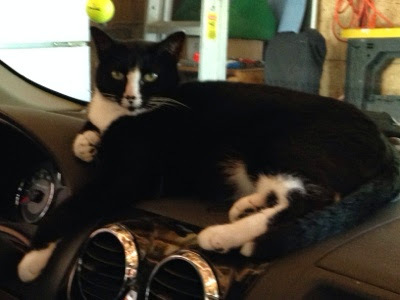 When Spencer left for college in January, Earl hadn't switched to working days. When he worked until midnight or 1 a.m., he often slept in (but never until 11). "No, Spence, Dad is at work." He looked puzzled. The entire world had shifted while he studied and partied in Florida. "Can I switch to the basement bedroom when Grace moves into her apartment?" he asked. "No, Tucker took over that bedroom. You can't kick him out." When Spencer walked in the door last night, he scooped up one of our cats. "He seems so much calmer," Spencer said to the cat. Just hang around for a little while and the cat will be skidding back and forth across the wood floors. In my new short story, "French Masquerade," a scene takes place in Musée d'Orsay. I have never met anyone who doesn't love Musée d'Orsay. When I picture walking through it, I imagine a stillness that belies the crowd, brought on by the impressiveness of the artwork. Here are a couple of pictures from Musée d'Orsay. 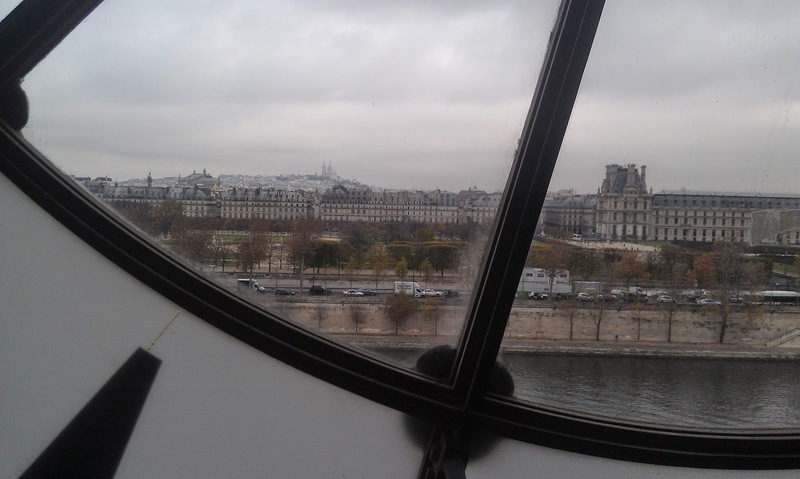 Here's a view from inside the museum taking a shot out the clock window at the Seine. Then here's an overview of the museum from the top floor. 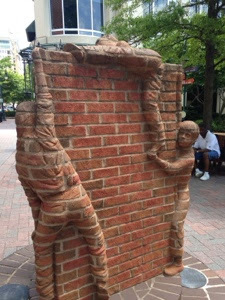 The architecture of the building is worth seeing, never mind the brilliant artwork inside. Last time we visited, we sat on the steps outside enjoying a snack before soldiering on with our sightseeing. Here's a picture of my husband resting outside Musée d'Orsay. 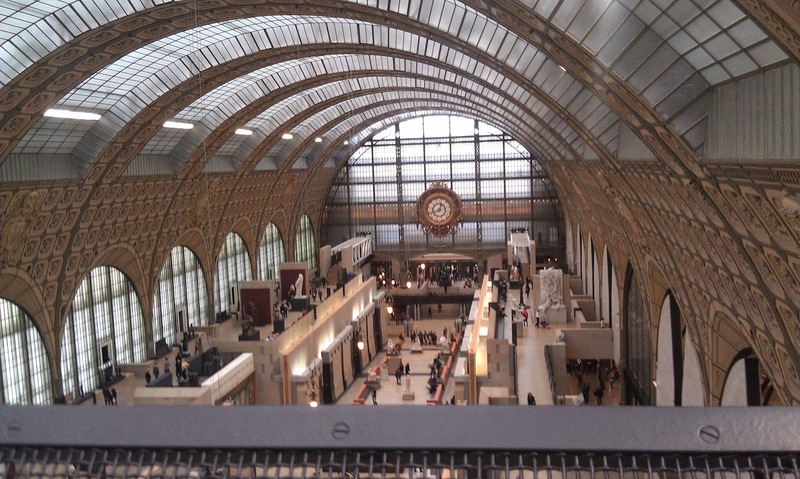 Do you have a lovely memory of visiting Musée d'Orsay? Share it. 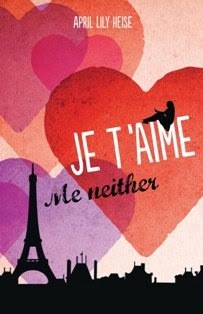 And I'd love it if you'd consider buying my short story, "French Masquerade" on Amazon for 99 cents. Also available in Amazon UK for 77 pence. 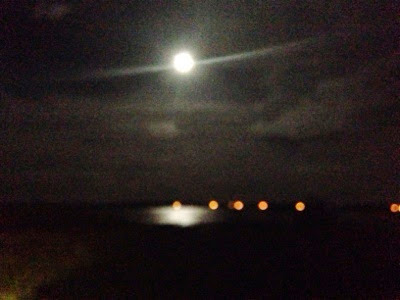 After driving 16 hours on Wednesday, I pulled into my parents' neighborhood, cruising past a quiet lake, and saw the full moon reflected there. The lights could be buildings or car along the highway opposite. Next weekend is the final high school graduation for my family. I'm expecting it to be hectic, thrilling and fulfillling. Hope everyone is having a terrific weekend. 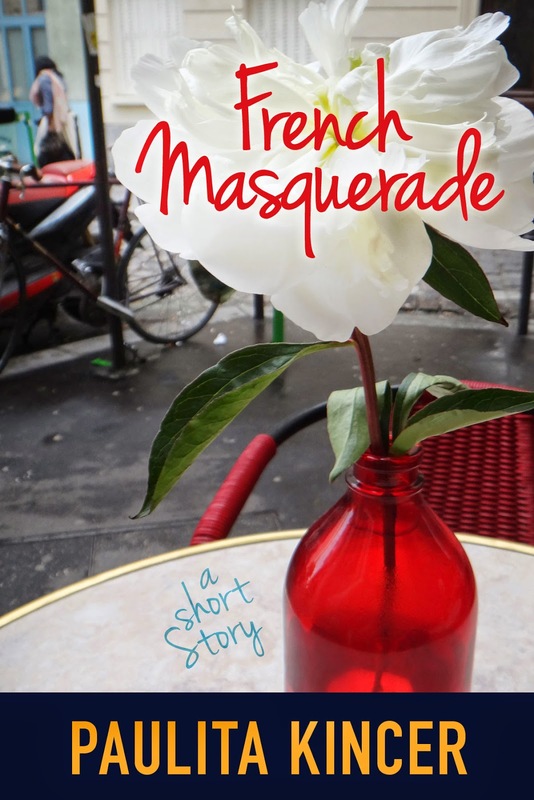 I'm so excited to announce the publication of my short story, "French Masquerade" on Kindle. I probably wouldn't be nearly as excited if not for the adorable cover, made possible due to the great photograph by Linda Mathieu on Frenchless in France. I hope you all will consider downloading my short story. It's only 99 cent on Amazon Kindle. Finally, I'm very close to having all three of my children together. I'm in Florida with my two oldest, Grace and Spencer. Grace finished with college for the year on Tuesday, moved her things home, and we left the next morning to drive to Florida. It was a very long drive, or maybe it just felt that way because I am getting old. I usually drive the whole way myself but on the last stretch of the trip, I let Grace take over. Part of what made the trip long, was that we stopped at a park in Charlotte, North Carolina. Our route goes by Charlotte and I had heard about a pretty park there from Jackie McGuiness at Junkboat Travels. Driving into Charlotte, Grace and I were both struck by how much it felt like our hometown Columbus, Ohio. It's a small, bustling downtown area, which, we noticed, is called "uptown" not downtown. Charlotte is one of the cities that Grace is considering after she graduates from college. She put it on the top of her list after our stop at The Green. 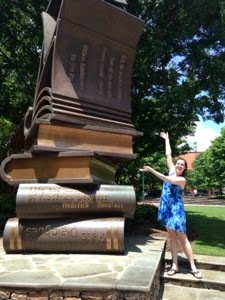 The Green is a bookish park with author's names as mile markers and stacks of books as statues. We loved it. We got to my parents' house on Wednesday night. 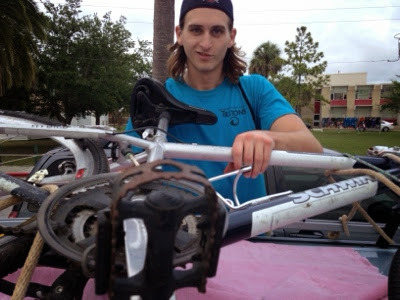 On Thursday, I drove over to St. Petersburg to pick up Spencer from college. I hadn't seen him since Jan. 3 when I dropped him off at school. I've talked to him on the phone and texted plenty, but there's nothing like hugging your kid. We loaded up all of his belongings, filling a trash bag full of his big basketball shoes and tying his bicycle onto the top of the car since I forgot the bike carrier. It's been a tough year for Spencer in many ways, but he's healthy and he persevered. And I still owe you all the "mafia" story. I promise I'll tell it someday soon. Now Grace, Spencer and I are at my parents house for a few more days until we drive back to Ohio. Meanwhile at home, Tucker finished his last day of high school. Every year at our school, the parents and underclassmen line up for the seniors to walk between us on the last day. They go to the football field across the street and after a few speeches from the students, they release balloons (biodegradable) into the air. I have missed this ceremony for both of my boys, but Earl has gone both times and took pictures. My friend Betsy also took some pictures of Tucker for me. 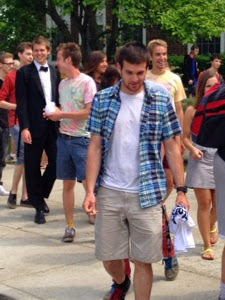 Tucker had an AP (Advanced Placement) test on Wednesday afternoon, so he didn't think he'd get to walk with the seniors. He really wanted to be a part of it though. He asked whether he could skip the exam. The exam can be important because students can earn college credit. They take an advanced class all year and the official AP Exam is what earns them college credit. It doesn't affect their actual classroom grade. To me, the college credit seemed more important than a few minutes on the football field, but maybe I wasn't thinking enough about the emotion of it all. He ended up taking the test and still getting out in time to walk with his friends. Here's a picture Betsy sent me that I love. I can picture him hurrying out of the test to join his classmates, afraid he'd be late, but no, there they were. He's smiling to himself with an array of friends behind him. In a few more days, we'll all be home together preparing for a weekend of graduation and celebration. Grace moves out in June, but until then, I'll have all my children together for a little while longer. Why is it that as a writer, as a woman, I let criticism eat away at me but let praise slide by as if it's not important? I noticed this morning that I had a new review on Amazon for The Summer of France from May 11. The reader gave me a 5-star reviews! Then I noticed another review from April -- a 4-star review. Those are awesome, but rather than basking in the glow of good reviews from readers, my eyes were drawn to a 2-star review from January. That reader called the book "trite." Then a review from December called the book, "A waste of time." These are the only two, 2-star reviews I've received on my novels, but those are the ones that will stick in my brain. Why can't I focus on the review that says "a wonderful book" or the one that says "Surprisingly intuitive about the emotions involved in a life-changing situation." I need to focus more on the positive and let the criticism go, like a bubble blown through a wand, it floats away into the air and disappears. Hmm. Maybe it would help if Amazon didn't feature the two negative comments. I'm going to go for a swim to help me forget. Then maybe I'll check the reviews on my other novel. 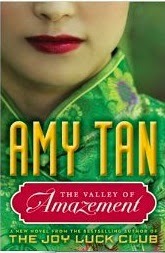 Yesterday I started Amy Tan's The Valley of Amazement. I'm expecting great things because it's by Amy Tan. The woman's face was contorted and her shouts were faint, distant. She had deafened one ear. She slapped my face and more stinging tears rose. "Do you understand?" she said in a faraway voice. I could not gather my senses long enough to answer before more slaps followed. Sounds totally different from the intro, doesn't it? Things must really go south for this character in the first hundred pages. 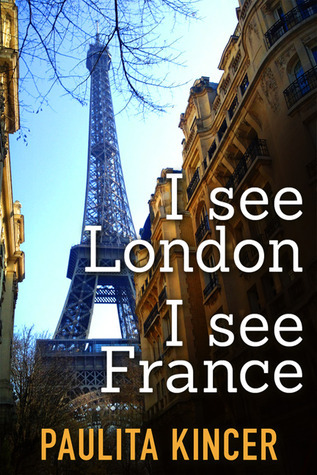 If you're on Goodreads, enter for a chance to win a paperback copy of my novel, I See London I See France. I'd love it if you'd friend me on Goodreads too. I started a new memoir this week. 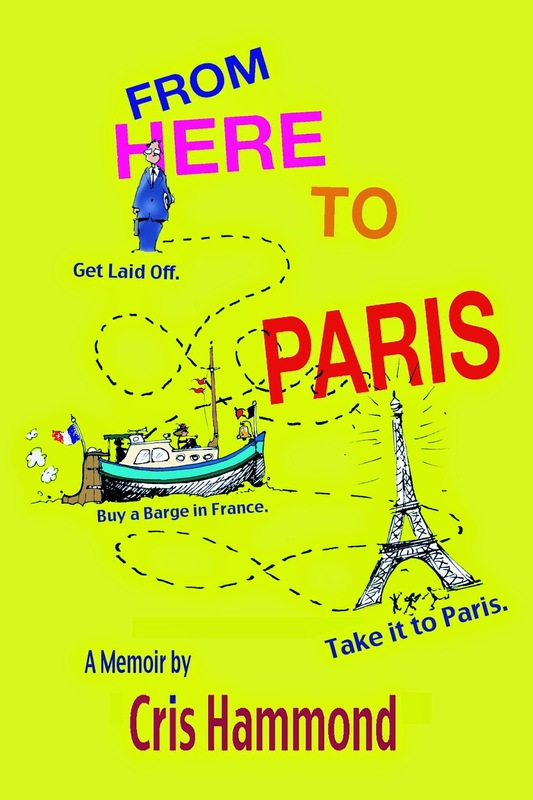 From Here to Paris by Cris Hammond tells the story of a nearly 60-year-old man living in Los Angeles who lost his job just before the recession. He and his wife decided to buy a barge in France and live on it for part of the year. Hammond is also an artist who paints while he is in France and I'm enjoying his adventures. My husband is also reading it and has actually laughed aloud at parts of the book. My review of this book won't be published until the end of June, so you'll have to wait a while to see my final verdict on the book. The sun was setting by the time I checked into my room at Chez Holiday Inn on Rue de Lyon in Paris. I was jet lagged and tired but desperate to stretch my legs, so I went down the street to wander around. The glass doors at the Holiday Inn slid open and the city poured in. Contrary to just about every movie depiction of Paris, the true sounds of the city aren't accordions playing La Vie en Rose. Rather the broad tree-lined boulevards and quaint side streets reverberate with whining scooters, thundering motorcycles, small honking cars, tinkling bicycle bells, and bleating police claxons, all clog dancing over a background buzz of people talking a mile a minute. The pace is manic. Engines of all sizes impatiently rev at stop lights while pedestrians, dressed in black with nine-foot-long scarves, leap off the curbs with the assurance of trapeze artists who know they'll always be caught by their lover and greeted with a kiss on each cheek. I enjoy most books that take me away to France. A well-written book, I enjoy even more. What are you sharing about France today? For more than half my life now, I've lived far away from my mother. When I was 24 I went off to grad school in Washington, D.C. then moved to Florida, Michigan and back to Ohio with my parents long since moved to Florida. I try to go down there at least once a year and they come to Ohio a few times each year, but it isn't the same as living close. 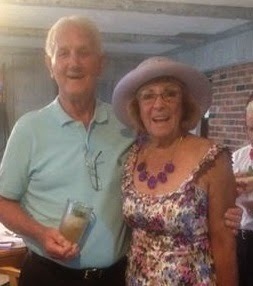 Here's a picture of Mom and Dad at a recent Kentucky Derby party. You can see that they are definitely enjoying themselves. 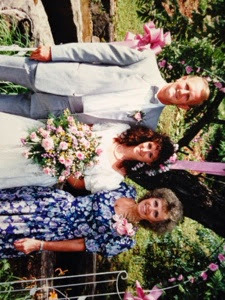 Here's a picture of me with my parents at my wedding. Mom was just about the same age I am now. 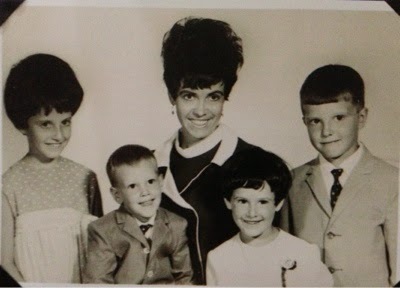 And, finally, the piece de resistance, a family photo from 1968. You can see that Mom had her hair teased high and she let me sister get her hair teased too. Tammy was 9. I even got a little lift to my hair. I was five. I'm sure there were plenty of Mother's Days when I wasn't thankful enough, when we kids tried to plan a special mother's day and instead it left a big mess for Mom to clean up. I'm really grateful for my mother. And I get to see her next week! Too much drama this week. I want to revert to simpler times. Here are my kids standing in a river on a field trip to Texas where we got to stand in dinosaur footprints. This is Tucker's last full week of school, so we've come a long way since then. 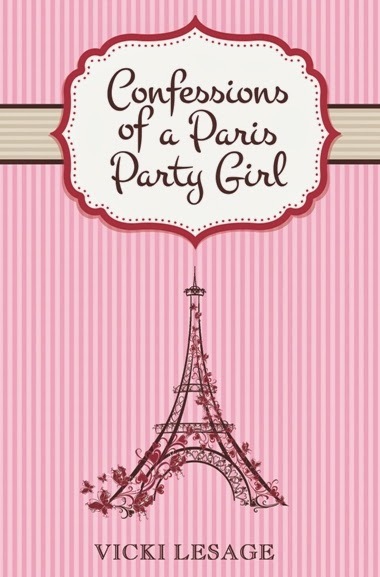 Today, I'm teaming up with Vicki Lesage, author of Confessions of a Paris Party Girl to tell you about some books for people who love France. (Find my teaser and first paragraph at the bottom). I haven't read all of these books, so make sure you take a look at the reviews before you plunge in and buy one. 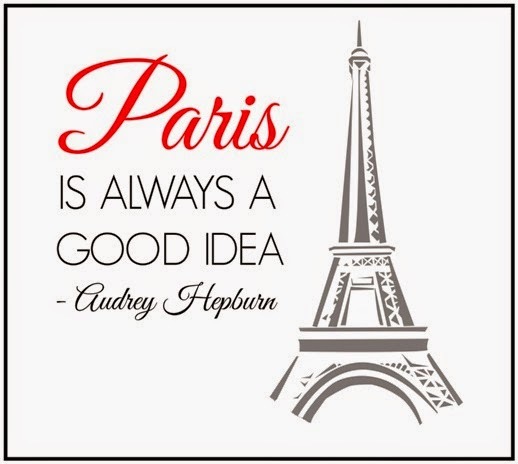 Audrey Hepburn had it right when she said "Paris is always a good idea." The City of Light is loaded with charms and wonders you can't find anywhere else on the planet. 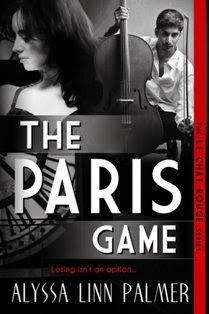 Books about Paris are a surefire hit – from romance to mystery to intrigue, what better way to fantasize about Paris than reading a book about it, preferably over a glass of Bordeaux? Vicky hand-picked a selection of French-themed books below and to help you decide which ones fit your style, she asked each author to answer two of the following questions: 1. 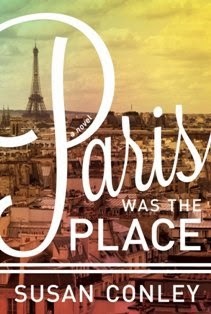 Why is your book a "good idea" for someone who loves Paris/France? 2. If your book was a drink, what would it be? 3. Which scene might raise a few eyebrows? 4. Who would absolutely hate your book? Read their responses and check out their books! 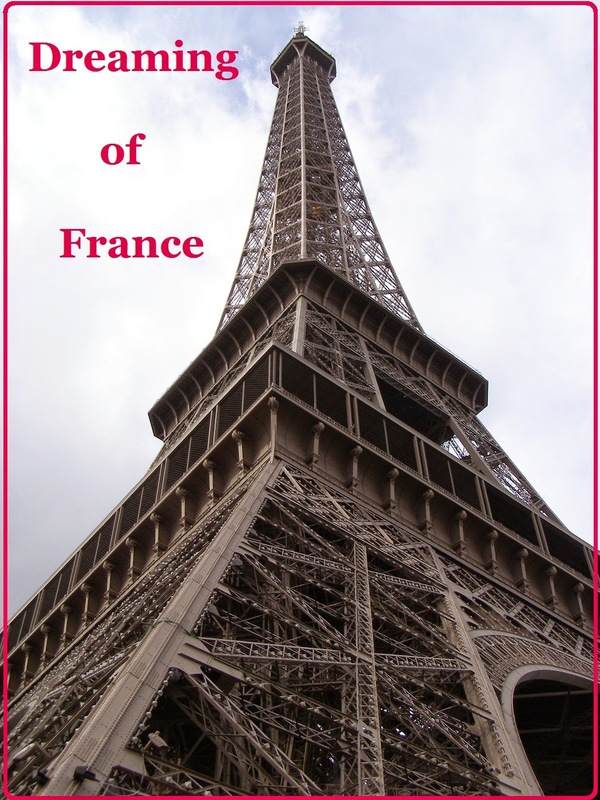 Playing along with Diane at Bibliophile by the Sea with First Paragraph, and Tuesday Teaser with Miz B of Should Be Reading, here's the first paragraph, which will count as my teaser too, from Paris Rue des Martyrs by Adria J. Cimino. 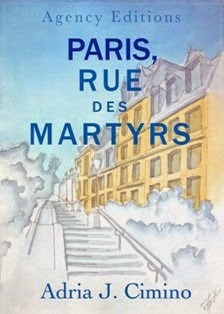 Rafael Mendez arrived like a thief in the night at 120 Rue des Martyrs. He ran all the way from the train station, where he had left one small, ragtag suitcase in a rented locker. His sneakers slapped noisily along the cobblestones, then pavement, in time with his own tears, and the rain falling from a grim Parisian sky. 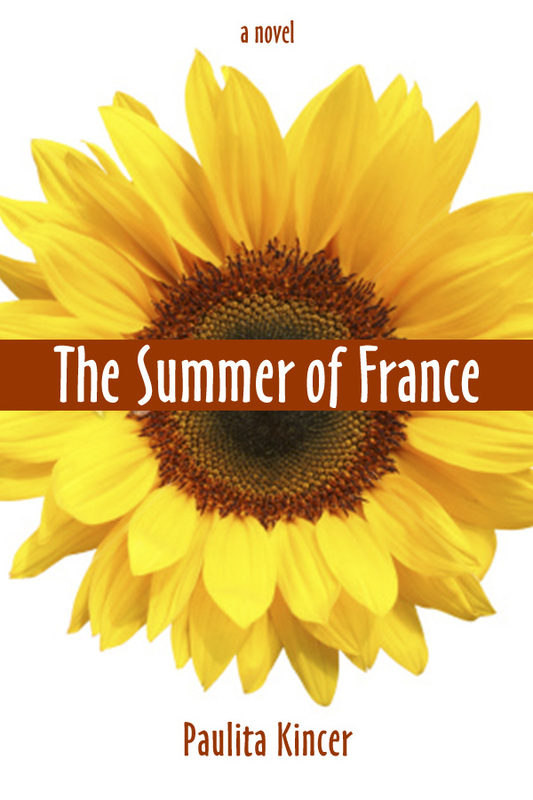 Hope you'll try one of these books set in France. I consider myself fairly tough emotionally. I have thick armor. Most of it was built up out of necessity. 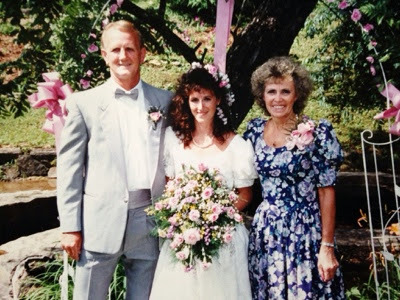 My parents divorced when I was three, so I was raised in a single-parent home long before it became the norm. They reunited when I was 10. My sister died when I was 14. I had so many stupid love relationships because I felt desperate to find a man and be part of a couple. Over the years, that stuff builds up. So I'm surprised how deeply one of my children can still wound me. Even as I write this, I'm tearing up. And I'm not a cry-er. I have three kids, ages 22, 20 and 18. They do things to stress me out all the time, but generally, it's not aimed at stressing me. Sunday, my youngest, a senior in high school, sent an arrow flying that pierced my heart and leaves me somewhere between silently resentful and passive aggressive toward him. 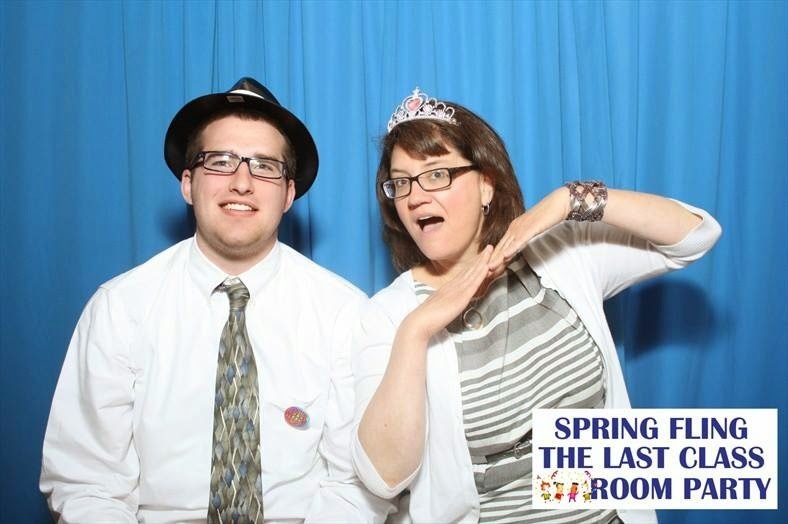 Four years ago, another mother and I planned that when our sons were seniors, we would go to the mother/son, father/daughter dance together. The dance is held during the kids' senior year, and here it's called Spring Fling. We get dressed up. We have a nice dinner. We dance with our kids who will soon be flying the nest. We don't do this any other time during their growing up years. This is it. I asked Tucker about it nearly a month ago. He told me that was the weekend of the Frisbee tournament, so we might be late. I was okay with that and I paid the $40 for our tickets. Here's a photo from the dance last night. Not me and Tucker. Sunday morning, I braved the high winds to sit through two of the three Frisbee games. 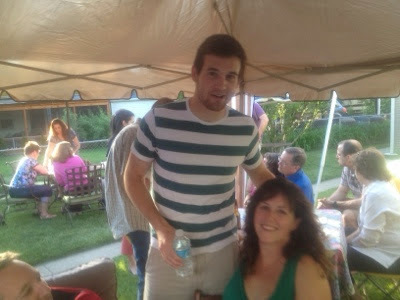 Then I hurried home to go to a graduation party for another friend's son. Next I went to ballroom dance class with my husband. I donned a party dress and waited for Tucker to get home. His last Frisbee game ended at 3 p.m. He walked in the door around 4:30 with a burrito from Chipotle. "We just have about an hour before Spring Fling," I told him. "I told you I didn't want to go to that. I'm too tired," he said. "All the other seniors who played Frisbee are going," I said. He named two boys who weren't going. "I never told you that I would go. I told you we had tournament this weekend." "You told me we might be late because of the tournament," I pointed out. "You had three games yesterday and you went out until midnight last night," I argued. It didn't matter. He walked down the stairs to the basement. I texted the mother we were meeting and the mother we were supposed to ride with. My texts were juvenile, full of anger at my son who I called "a jerk" and "immature." Of course, both of those things were true. After about half an hour, I changed out of my party dress. I tried to read on the front porch then I hunkered down in front of the television. I imagined punishments that I could give him. I'd take away his cell phone. I wouldn't let him drive a car. I wondered if he could go to college early so I didn't have to deal with him this summer. This is the only time we will ever have this one-on-one date. Sure, he might dance with me at his wedding, but it's definitely not going to be all about me and him. I assuage my hurt feelings, remembering that I got to go to the dance with Spencer two years ago when he was a senior in high school. This morning, I'm still feeling sad. I tried dancing to "Happy," but it didn't chase away my blues. I talked to an ESL teacher who told me I should teach English in China this summer and, like a character in one of my novels, I spent an hour searching sites, wondering if that would be the best way to escape my children home for the summer. I realize I should simply say to Tucker that he truly hurt my feelings. There's no way for him to make it up to me now, but I shouldn't hide my feelings, as I have for years while the kids were little. He needs to know that his actions have consequences. He may not regret his actions now, or this year, or even next year, but he's enough like me that I know in 10 years, he'll probably beat himself up that he didn't go with mom to Spring Fling. He's just too young to know it yet.